part of the Marcus Center in Milwaukee, WI, USA. 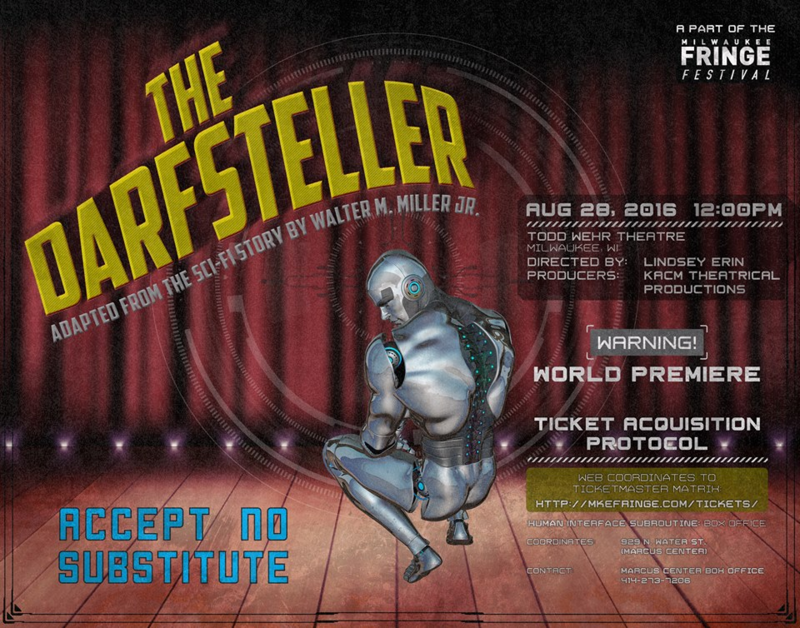 Walter M. Miller Jr’s classic 1955 science fiction story is now a play! In the near future, technology has caught up with live theatre. Amazingly lifelike robots are now programmed with the personality and talents of famous actors. Controlled onstage by an Artificial Intelligence called The Maestro, not only do robots perform a play in both character and persona, sensors in the audience measure responses to adjust performances and even alter endings for the best live theatre technology can offer. All this is too much for Ryan Thornier, a living, breathing actor of the old school, reduced to penury and obsolescence by technology. From his modest custodial position at a major theatre, Ryan comes up with a plan to hit the stage one more time and make his final exit in a blaze of glory. But when former leading lady and love interest Mela Stone joins him on stage, the plot thickens in ways that don’t compute!